My Hilux is overheating when standing in traffic. Temp is quite normal while driving but if I stand still in traffic it starts to heat up and if I don't get moving it gets very close to the red. When I drive off it immediately drops back to normal operating temp. I have checked the visco fan and it is running, how effectively I don't know. Is this something I should tackle on my own or should I involve a pro? I am assuming the viscus has never been replaced? If not, that's where I would start. 1. Do an engine/radiator flush with one of the reputable products such as Wynns. You are going to be replacing the coolant anyway. 2. Replace the Thermostat. It is most certainly not up to spec anymore due the the many times it has opened and closed. This means it is probably not opening properly slightly hampering the flow of coolant. 2. Remove and have the radiator properly cleaned (descaled) inside as well as outside and checked for leaks. 3. Replace the water pump. (depending on how long ago it has been replaced) The impeller vanes could have deteriorated due to rust (if anti-freeze levels were not adequately maintained) and other wear such as cavitation. If you fit a new pump you eliminate one of the variables. 4. Check all the rubber hoses for damage due to perishing and replace any suspect hoses. Thoroughly clean all the fittings before you re-fit the hoses. It may sound like a lot but heat is the worst enemy of any engine. Do the above and I can guarantee you that the issue will be resolved. Agree with what Marnus is saying, it could be one or a number of causes. The fact that it cools down when driving suggests inadequate airflow to be the, or one of the factors. I would first look at the visco fan and check the cowl around the radiator and fan. 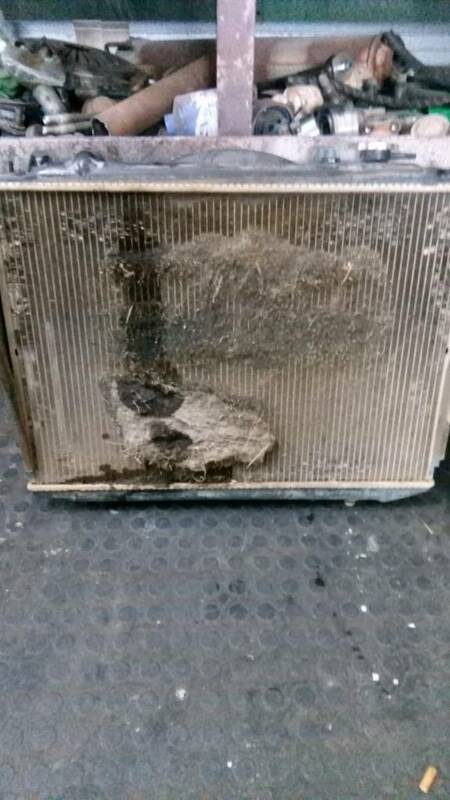 Yes by all means do the radiator flush, inexpensive exercise and can only do good, but also check the condition of the radiator fins ... if they are corroding away or even clogged with insects and debris the radiator cannot do it's job properly. Replacement of the thermostat is also a good idea, easy to do and also not expensive. Many visco fans can be refurbished by replacing the silicone oil in the hub (I think Toyota actually carry it in their spares dept.). If all that fails, I would then replace the water pump last ... most expensive and time consuming of all the options. IMO the pumps are the least likely culprits - yes the impeller vanes can corrode / erode if there has been a long extended period without anti-freeze but generally they last pretty well and replacement is usually because of a leaking shaft seal. Hi Mud Dog, I have unfortunately had a period of about 5 months without anti-freeze.....procrastination is the only reason. I'm hoping the damage is not too bad! Well the cooling system needs a functional radiator, adequate airflow to cool it and adequate coolant reticulation / flow to take the heat away from the motor. It also to a lesser degree needs a pressurised system because the boiling point of the coolant is raised if under pressure - anti-freeze also helps raise it further. If you're not loosing coolant then you should be OK in this area. Airflow is affected by the efficiency of the fan (the cowl plays an important part here) and if there are any obstructions to airflow like spots or stuff mounted in front of the radiator grille and of course debris blocking the radiator fins. Reticulation is affected by the efficiency of the pump or any obstructions like a partially open thermostat, blocked water galleries in the motor (head) or a chocked radiator. Given the age of the vehicle and having run without anti-freeze, the possibility of the pump being the or one of the culprits becomes greater. I hope it's not the cause but I'm not holding thumbs on that either now. I bled the system after using radiator flush. Water was not as bad as I thought it would be. I replaced the thermostat, it looked a bit worse for wear! System was reloaded with water & antifreeze mixture and seems to be working. Big test is tomorrows traffic. I tried idling it to make it overheat but it stayed constant. Hold thumbs! Drive to work was uneventful but the traffic was very light. The few times I parked at an intersection the temp needle didn't move. I'm hoping the problem is now in the past. I'll find out for sure this afternoon as my afternoon commute is a lot heavier than the morning one! One thing I failed to mention in the previous post, when I added the radiator flush the water level in the radiator was quite low. I needed to add at least 1,5l of water as well as the 450ml of radiator flush to top up the system. The resevoir bottle was full though. In fact is was about 50% over filled. I did blow out the siphen pipe in case there was a blockage in there. I'll be checking the water levels daily now to make sure the engine isn't using water. As a side note...I've not previously had any water or oil usage issues. The overheating at stops could have pushed that water out. 1.5 lit is a lot, even half a litre short will make a difference. What concerns me is that it wasn't sucked back into the radiator from the reservoir ... could be that the radiator cap is also faulty, so I would replace it anyway - just to be sure. Check the coolant levels (radiator and reservoir) in the mornings when the motor is properly cold. Good luck, hope your problem is solved. Yes that is good advice to replace the radiator cap. I forgot to mention that and make sure that the surfaces where the radiator cap mates on the radiator are clean and smooth to ensure a good seal there. I know this sounds silly, but I was losing coolant on my 1HZ. Replaced the cap, nothing changed. Changed again and problem solved! The system is designed to work as a specific maximum pressure. If you get a cap that is below that rating it is going to release pressure with the accompanying coolant. Mars wrote: The system is designed to work as a specific maximum pressure. If you get a cap that is below that rating it is going to release pressure with the accompanying coolant. Mine worked the other way around...cap rating was lower than the cap it had. Sorry I did not read your post properly. Yes that is strange. Shane, the probable reason for loosing coolant with the higher rated cap is that the resulting additional pressure in the system could have pushed coolant past a hose clamp or even the pump seal. If that was the case then you would have lost coolant. I'm going to check the levels now during our lunch break. Good point on the radiator cap. I'll check the condition of that too and call around for a replacement! Would a normal spares shop stock it? Radiator level is low again.....it is a 1.1 bar cap. I'll calll around for a replacement! Don't stress too quickly. The level will drop after you have done a coolant replacement even if you bled the system. Top it up, drive it home and check again tomorrow morning. The spares places should stock them. Was the higher pressure cap on there all the time before? Sylvester wrote: Radiator level is low again.....it is a 1.1 bar cap. I'll calll around for a replacement! That is a good point and exactly as you implied, the water level seems to be consistant now. I'll keep monitoring though. I am going to do another flush in a week or two as I am now unhappy with the ratio of water/antifreeze with the recent top ups it has been pure water. It is the same radiator cap that has always been on the vehicle for the last 5 years since the radiator was replaced so I am hoping/assuming it is correct. Thanks for all the advice guys, really great to have it "at your fingertips"! What is the ratio of water to Antifreeze supposed to be? Depends if it says Premix on the bottle or not. Premix (such as Castrol Radicool and Toyota OE) you put in neat. Additive coolants are often 50:50 with water. Those will most likely tell you on the label. I have the same problem just the other way around.Cools down on idle and heats up on driving.